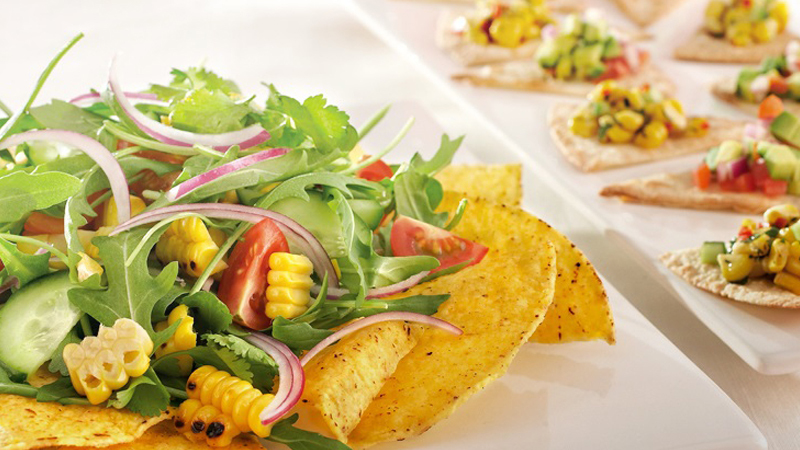 This Crunchy Taco Salad recipe from Old El Paso™ uses our original Taco Shells and delicious fresh ingredients like rocket, cucumber, coriander and corn to create a delicious Mexican meal for 6 people in just 20 minutes. Whisk dressing ingredients together with a fork. Preheat oven to 180°C conventional (160°C fan forced). Remove Tacos from plastic, keep heatproof wedge inside shells to retain shape. Fan Tacos slightly apart on tray and heat in an oven for 5 minutes. Break into large pieces and place on a large platter. Combine onion, cucumber, tomatoes, avocado, rocket and coriander. Cut corn from cob with large knife and toss all ingredients together. Place on top of taco pieces and drizzle with dressing.